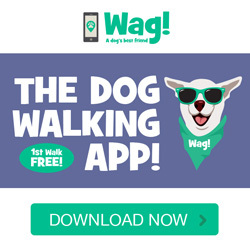 Get the #1 dog walking app & get your first walk FREE! You can book a dog walker on-demand, or at your convenience. Experience every step of your dog's walk through text updates, live GPS tracking, pee/poo notifications, and photo report cards. Wag! dog walkers are thoroughly vetted and tested on dog handling experience. Wag! services are insured and bonded with customer support around the clock. Your pup is sure to love all of the amazing Wag! dog walkers.